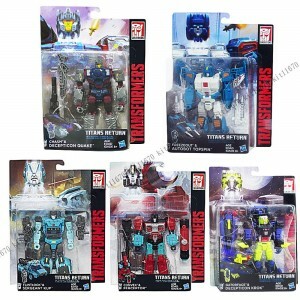 As we indicated the other day, the street date for the 4th wave of Titans Return toys has passed and while they won't be available domestically in the US for a little while, they are now popping up online in great number. E-bay now has several listings for all the characters in the wave and depending on where you are wolrdwide, it may even be at a similar price to the one you would pay. For instance, here is a whole set of the deluxe class including Perceptor, Krok, Quake, Topspin and Kup for US $129.99 / £104, from the animetropolis store. There is also Roadburn for US $11.90 from from the Element+JoeyYamamoto. The premium differs from store to store, as does the shipping. But for anyone wanting them now or worried of not getting them later, these are viable options. I hope a lot of third-party or Shapeways folks leap on the chance to make sets of guns to replace all the awful looking ones with "seats". Why wouldnt it be legit? These are new toys, there hasnt been a chance to KO them yet. So yes, this is the legit toy. However, due to it not having a box, it is probably a factory reject. The person probably made a deal with the factory to get their rejects, they might be stolen, who knows. Back when toys were made in China, there was a lot more stuff like this, and we were able to get crazy deals on toys which didnt have packaging. Like Exclusive Cloud figures for $20 and Calvin Johnson Megatron toys for $10-$15. But unless you live in a place that does not stock Transformer toys (like many parts of Vietnam, ironically), I would wait for you to buy this in stores or online from a standard retailer. It could even be cheaper and it would come new in its box. Plus, $0.49 shipping from a seller in China? That is probably going to be a fairly long wait just to see if the quality is there for essentially the same price if you are in the US. Heck, you may even find them locally while you are waiting for this one to arrive. TF-fan kev777 wrote: Plus, $0.49 shipping from a seller in China? That is probably going to be a fairly long wait just to see if the quality is there for essentially the same price if you are in the US. Heck, you may even find them locally while you are waiting for this one to arrive. Not perfect but waaaaaay improved. Both of those still look much better than this guy as he is officially Transformed. 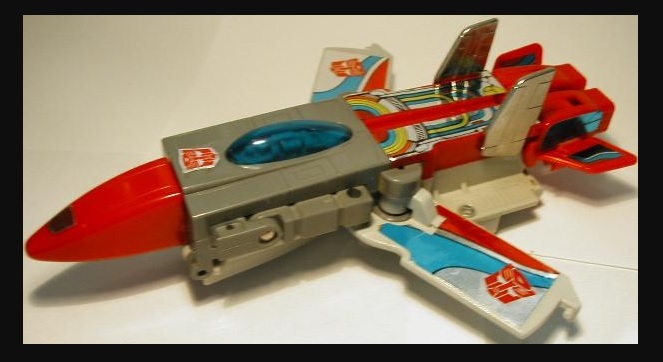 Seriously, that jet mode on TR Broadside is a compete joke and looks worse. "Tidal Wave... you're supposed to be transforming into a Jet Mo--"
How is Takara even supposed to change the jet mode do you think Takara would make new tooling? In that case why would Hasbro not just release that version then? I think the only differences are going to be paint. To be fair the same could be said about many other products Takara has heavily retooled from Hasbro in recent history - Computron and Ginrai, for instance. Still, for someone so D-list and obscure I can't imagine them changing the tooling beyond a cartoon-accurate face. I mean it's possible, but don't count on it. Kurona wrote: To be fair the same could be said about many other products Takara has heavily retooled from Hasbro in recent history - Computron and Ginrai, for instance. I meant specifically that they would make new tooling for only the jet mode yet somehow nothing would change the robot and ship mode. For Ginrai Takara changed both modes drastically and for Computron Afterburner was the exact same as the Hasbro version with different paint, Lightspeed was just the Wheeljack mold with a new head and paint that Hasbro simply did not use, Strafe is a remold of a mold that did not see Hasbro release although instead Hasbro made their own retool for Strafe that did not see a Takara release and finally Scattorshot and Nosecone are drastic enough retools that I don't understand why Hasbro did not use them so I agree with those two. No, Takara made that head new. The unused pretooled Wheeljack mold headsculpt is the upcoming TFSS Counterpunch head. guess i'm gonna have to try and hunt them down as individuals. Really not trying to rain on anybody's parade, just trying to understand. Simply put, this is the first time they've been available for purchase - despite the fact the price is outrageous, it's still news. Cyrano wrote: Really not trying to rain on anybody's parade, just trying to understand. The prices you use for comparison are all US centric, this listing and the news is for the whole world to see. Colletors in japan pay $36 per deluxe http://www.redmercury.co.jp/shop/detail ... =RED-13802 And other ins brazil pay similar too. And many reviewers and people who want to make early galleries like having these in advance. The premium they pay can be offset from the extra youtube revenue of having figures early. In the end, your argument was just related to the US while that is just 1 out of the 196 countries in the world.